Once upon a time I drove a mostly tidy car. There were notebooks and pens within easy reach of the driver’s seat and a bundle of extra clothes, a warm blanket, and other essentials stashed in the back. These days I drive a minivan, which is basically a mobile extension of the family mudroom – and just as disheveled. Minvan cargo: Life preservers, jumper cables, and PB&J. Now, at the start of summer, there are tennis balls and soccer balls rolling around the back of the minivan. They share that space with a boogie board or two, some swim goggles, and a collection of chocolate-smeared paper napkins left from our last outing to a favorite ice cream joint. On any given day, you might also find a wayward soccer cleat, a bottle of sunscreen escaped from the pool bag, and sweatshirts discarded between cool mornings and the heat of midday. And sand. Sand from the river, sand from the beach, sand from the driveway. Sand is pretty much a constant in my car, along with Goldfish crumbs scattered about the floor, wayward water bottles, seemingly random rocks collected along our travels, and the occasional sock wedged under a seat. While the mess within can be maddening, I have come to love the minivan, in large part for its ability to (mostly) contain the ever-evolving craziness of life with kids. It was not always this way. In fact, I was horrified when I realized I might need to drive a “mama mobile,” this vehicle that so clearly broadcasts domesticity and parenthood. I was a pickup truck girl in high school, and there is a photo of me in the yearbook posing proudly by my little Chevy S-10. During my college years, tired of driving the six-plus hours to and from campus to leave me and retrieve me, my parents bought me a used Ford Bronco II – a truck-car so awesome they don’t make it anymore. I drove that boxy gas-guzzler from New England to Upstate New York and back a bunch of times, then out to Colorado after college. I drove it until fourth gear quit working, then I drove it another year or so, jumping from third gear to fifth on the rare occasion I needed it while driving the winding mountain roads. When the Bronco II was completely used up, I bought a used Subaru. That little car could go anywhere, through any weather. I drove it around town, then across the country loaded down with all my worldly belongings when I moved back East, then to work gigs and fun outings until it started sputtering. The Subaru-wannabe I bought next, brand new, carried me from life as a single girl right into motherhood. Two infant car seats fit snugly in the backseat, and there was space for the dog in the way back. The gas mileage was good, and the car was sufficiently, I believed, sporty – and roomy. Until kid number three was on the way. I distinctly remember standing in my parents’ driveway, while retrieving kids number one and two from a visit, and lamenting the fact that I was trading in my car – for a minivan. “There goes my image,” I told my mom. She looked at me with something bordering on pity. I’m not sure if it was because I was soon to enter the wild and sleepless world of a third child under the age of 3 or because I was quite obviously delirious. Image? I don’t know what image I thought I had then, but it certainly wasn’t one of any sort of hipness. Most of the time I had two toddlers clinging to me, an array of dog fur and partially eaten kid food stuck to my yoga pants, and the disheveled hair and overwhelmed look moms of toddlers often sport. I was also quite obviously pregnant. Whatever image I thought I owned had long since shifted irreversibly. My mother tried to assure me that minivans were just fine. We’d had one of the original models when I was a kid, the first post-wood-paneled station wagon to serve as the standard American family car. That little Dodge Caravan had ferried us to ski races and soccer games and hauled the entire family and our pop-up camper on an epic cross-country adventure. The minivan has come a long way since those early years – automatic doors, folding seats to create various seating options, cruise control, and more cup holders than any seven passengers could possibly need. After nearly eight years of ferrying our family and all its stuff, my van is not the gleaming silver bullet of family transport it once was. There are dings in the body and rust creeping along the wheel wells, and the doors long ago stopped being automatic. But it can still hold soccer balls for two teams in the fall (along with several soccer players). It carries our family’s quiver of skis – and skiers – come winter. And last summer we figured out how to fit all five of our bikes – and all five of us – within it. 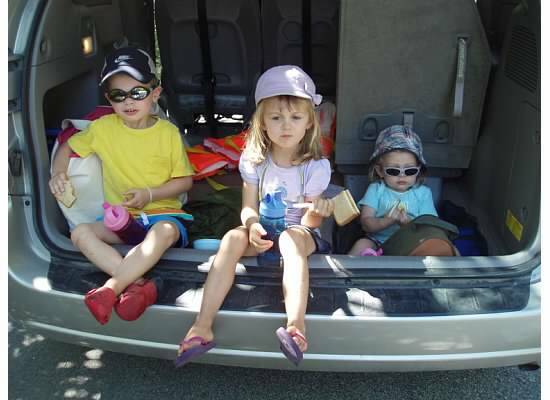 Call it what you will – Mama Mobile, Party Van, Adventure Wagon, Family Car. The minivan may not be hip, but it gets the job done, and I’m good with that. Original content by Meghan McCarthy McPhaul, posted to her Blog: Writings From a Full Life. This essay also appears as Meghan's Close to Home column in the June 24, 2016 edition of the Littleton Record. The countdown to summer vacation is on at my house, and it is on in earnest. Maybe it is because May slid into June through a near-constant string of sunshine. Or because the California cousins will be here before my New Hampshire kids are even done with the school year. Perhaps it’s that my two 3rd graders spent several spring days mired in standardized testing, which can cause even the most ardent of students to bemoan school. Whatever the reason, this year my kids have known exactly how many school days are left at any given time for the past few weeks. We’re almost there. A few more days. And here, on the cusp of summer, the anticipatory promise of all the good things that season should be is nearly overwhelming. We’ve had an early taste of some of our favorite summer things already. A few years ago it snowed Memorial Day Weekend, and the kids built a snowman beneath the newly unfurled leaves of the maple trees in the front yard. This year, Memorial Day Weekend was a sweltering tease of the approaching season, and we took full advantage, packing a load of pre-summer fun into three little days. We did a quick loop up our favorite short hike, joined a friend posse to cool off at Echo Lake, and took our first dip of the year in the Ham Branch. Since then we’ve added trips to the tennis court, pedaled through our family’s favorite bike ride, and opened our mini-golf season. We have broken out popsicles and ice cream on the front porch. The lawn has been mowed several times. The fire pit is ready for s’mores and socializing. The garden is in – mostly, anyway – and I can almost taste those first delicious peas, even though they’re still a few weeks away. And that is, perhaps, the impetus behind the countdown to summer: sweet anticipation of what we know is to come. Afternoons at the pool or the river. Feet in the sand at the beach or the dirt in the garden. Hikes up a few taller mountains, perhaps, or exploring new bike trails through the woods. Impromptu soccer games in the front yard. The rush of cooling air from soaring through back-and-forth arcs on the backyard swings. The twinkling magic of a million fireflies flickering through the field and of a gazillion stars overhead. With all of these things on the horizon, the two summer events my kids say they’re most looking forward to are The Cousins and The Cape. The first crew of cousins arrives from California during my kids’ last week of school. 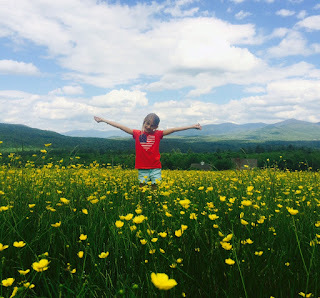 There are certain traditions we share with them during each annual visit – a hike up Bald Knob, a paddle around Long Pond, trips to the river my brothers and I cooled off in when we were kids, evenings by a backyard fire. The second set of cousins comes from Tennessee later in the summer, instigating gatherings with the other side of the family – and lots more fun. The other most-highly anticipated week of the summer is our annual pilgrimage to Cape Cod. This will be the fifth year my children have journeyed from the quiet mountains of home to the crowded beaches of the Cape. During those years we have settled into favorite beaches, ice cream haunts, and mini golf courses. It helps, of course, to have friends who live down the street and are happy to play tour guide for the week we are there, ferrying us to places only the locals know. Each year we find at least one new place to explore. That trip, though, is still many weeks in the future, many summer experiences down the road. For now, the full promise of summer sits just out of reach. It will be here soon enough. A few more days of reluctant early mornings and the confines of school days. A few more days to cross off the calendar. The countdown is on; summer will be here in 3-2-1. Original content by Meghan McCarthy McPhaul, posted to her Blog: Writings From a Full Life. This essay also appears as Meghan's Close to Home column in the June 10, 2016 edition of the Littleton Record.